Gets new touchscreen infotainment system. One of the bestselling SUVs in the country, Renault Duster has received some key updates including a new diesel-AMT option. Changes have also been introduced in Duster’s variant line-up with the deletion of mid-spec petrol RxL, Diesel 85PS Standard, and Diesel 110PS RxZ AMT and addition of petrol RxS trim with manual transmission. With these revisions, Duster is now available only in three trims – RxE, RxS and RxZ. Prices have also been reduced, a move probably aimed at clearing existing stock before BS-VI emission norms kick in from April 2020. Duster petrol variant is powered by a 1498 cc engine that delivers max power output of 106 PS @ 5600 RPM and max torque of 142 Nm @ 4000 RPM. Engine is mated to a 5-speed manual or CVT. Diesel variant gets its power from 1461 cc, 4 cylinder in-line engine that is tuned to deliver 85 PS and 110 PS. Former is mated to a 5 MT, while latter gets either 6-speed manual or AMT unit. All-wheel drive option is also available in top-spec RxZ diesel variant. There are no other major changes in Duster, except the fact that there are no airbags for the basic RxE trim. Security features that are common across all variants include ABS with EBD and Brake Assist (BA), engine immobilizer, rapid deceleration warning and remote central locking. Top spec has advanced security features such as reverse parking camera and sensors, speed sensing door lock, impact sensing door unlock, dual airbags, electronic stability program (ESP), and hill start assist. 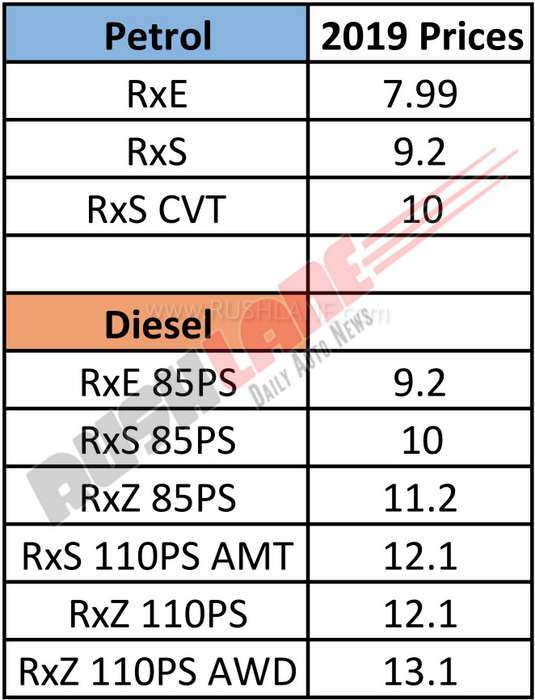 Below is the 2019 price list for Renault Duster. Other key features available in top-spec model include cruise control, speed limiter, electrically operated ORVMs, height adjustable driver seat, steering mounted controls, eco drive mode, 17.64 inch integrated touchscreen and audio system, gearshift indicator, front reading lamps, one-touch turn indicator and power windows with illuminated switches. 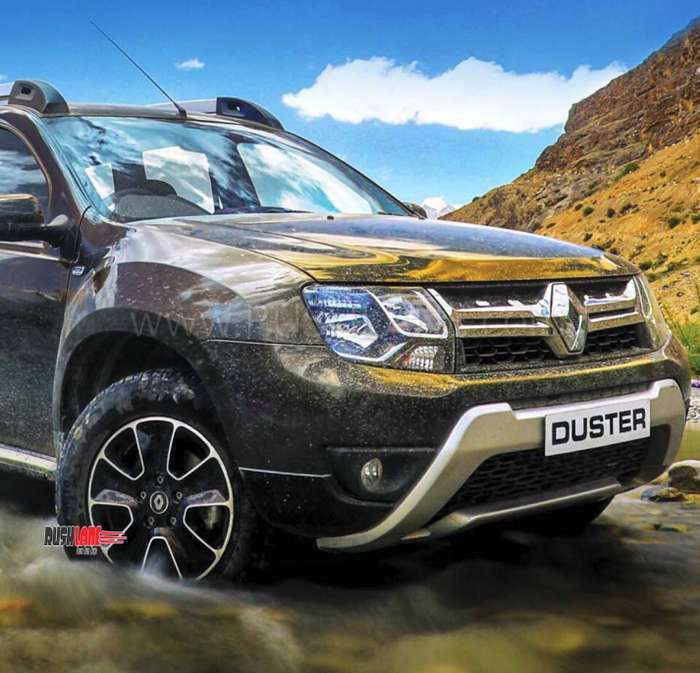 Duster range now starts at Rs 7.99 lakh (Petrol RxE), with the top-spec Diesel 110PS RXZ AWD costing Rs 13.09 lakh. All prices are ex-showroom Delhi. Duster’s primary rivals are Hyundai Creta and Maruti S-Cross. Below is new Duster TVC.